Thanksgiving is a pretty big holiday for my family. We always get a huge turkey that is no exaggeration around 50 pounds. My mom cooks dinner and I'm usually in charge of the appetizers, dessert, and choosing the wines. 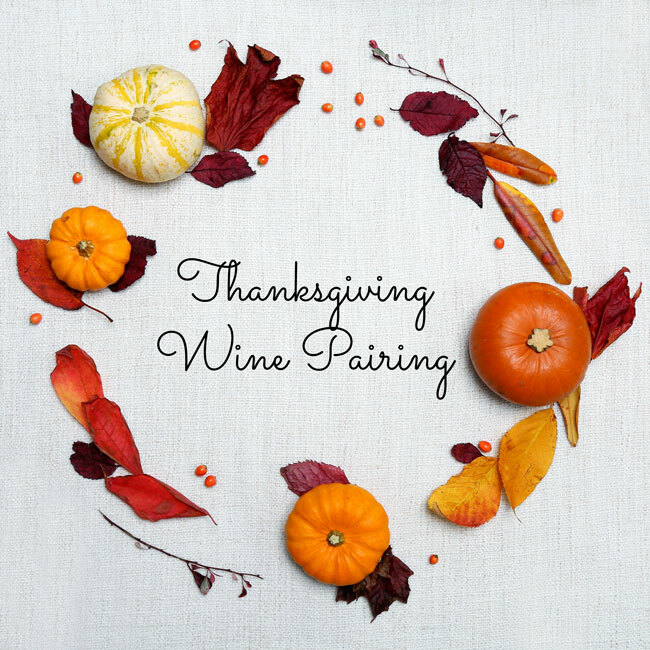 Pairing wines with your Thanksgiving dinner can be a tricky task. Turkey is poultry, but there are also lots of rich and heavy sides. Before I get into anything too specific it's important to know that there is no "right" or "wrong" when it comes to pairing wine with your Thanksgiving dinner. This is really more of a loose guideline for you to help you get started so that you don't get overwhelmed and find yourself in the middle of the store and completely lost. Just keep these things in mind and maybe ask an expert at the liquor store what specific wines they recommend that go along with your taste and the kind of wine you're looking to serve. First and foremost, it's important that you consider your guests and their taste. You don't want to only have red wine if you know you have a guest who only likes white, or only serve dry wines if you know that you have guests who prefer sweeter wines. Personally, I like to give guests a couple of options rather than choose for them what they want, so I find a good strategy to be to set out one red and one white and then let people choose which they would prefer. Champagne is always a bright and festive choice for any occasion. There's a certain je ne sais quoi when you pop the cork on a bottle of sparkling wine that makes it the perfect pairing for any celebration. Prosecco or a great sparkling wine from America can be a more budget-friendly option to serve that's still very cheerful and just as tasty. If I was only putting out one wine for guests, this would be what I would serve. When you think of pairing red wine with food, you typically think of pairing it with red meat and hearty dishes. But, when it comes to finding a red to go with your Thanksgiving dinner you're going to want to pick a lighter red wine. My go-to is a pinot noir. This is the classic choice, and admittedly not very adventurous; but the classics are the classics for a reason. Pinot noir is softer on your palate than other kinds of red wines like cabernet sauvignon; the lighter body pairs well with poultry making it the perfect choice. If you want to be a bit more creative try a slightly chilled Beaujolais or a plummy and peppery zinfandel. As far as white wine goes, think of pairing something with a little acidity to cut through all the richness of the traditional Thanksgiving feast. I wouldn't go with any white wines that are too sweet, save that for dessert. Mind you, I'm not a fan of sweet wines at all, I find them undrinkable but if you are a fan or have a guest that's a sweet wine drinker, go for it! An oaked chardonnay that has a little more body is a great and time-honored choice. Two other good options are a dry riesling or a light and crisp sauvignon blanc. Personally, I'm not a huge rosé drinker but I know it's trendy right now and a lot of you are probably into it so I tried to do a little research for you. This can be a good option because rosés have an easier time standing up to all the flavors in a traditional Thanksgiving meal than a white wine and they're lighter bodied than a red wine. I recommend going with a dry rosé for the same reason I would go with a dry white instead of sweet. A drier selection offers more versatility when it comes to food pairing than a sweeter wine. Whatever wine you end up going with, I wish you all a wonderful holiday and I'm sure it will be fantastic! Let me know how your pair wines with your Thanksgiving dinner down in the comments! You are so on point with your advice for thanksgiving pairings. My go to with the big meal is either a sauv blanc or a malbec but you are right, a pinot noir would pair much better. And yes to having two types of wine to select from. Thank you so much Sarita! That's one heck of a turkey! I have to say I'm really impressed with you wine knowledge! Thanks for the tips! Thank you so much Brooke! Glad to share it! I'm going to a friends giving and I can't wait to try a nice lighter red this season!! 50 pd turkey! Wow, Thanksgiving must be so fun with so many people. I have a very small family which sort of makes Thanksgiving not much fun. I use to love Rose until I got sick from one. But I love me some Champagne.